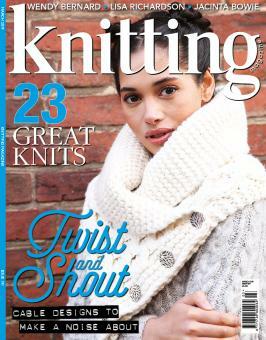 This month’s edition of Knitting is a cable knit special covering all things twisted and turned. We’ve got a collection of 23 beautiful patterns; featuring fantastic new takes on the classic style, from two-colour cables to flattering diminishing twist. Designs range from Jo Allport’s stunning Windows jumper, which experiments with cables and colours, to elegant lace and cable panels in the Hedda jumper by Bronagh Miskelly. Learn how to achieve the seemingly complex windowpane technique in the Masterclass feature, and bring all things cabled into your home with some fantastic cosy knits and gift ideas in Home Comforts. Wendy Bernard’s clever Basket Stich Pillow design is a real highlight for those wanting to easily add a cable knit touch to their interior. We’ve also got a profile of James McIntosh, who has coined the term ‘knititation’- a blend of knitting and meditation- which helped lift him out of a serious depression. So with all that plus all of our regular features, explore the joys of cable knitting with the March issue of Knitting, out now!